Please join us this November 6 – 8, 2018 for FABTECH in Atlanta, GA, hosted at the Georgia World Congress. Join the 35,000+ industry colleagues in one of North America’s largest metal fabricating, forming, welding and finishing event. Capital Machine and our subsidiary, Capital Robotics, will be showcasing the latest in robotic welding. The booth will feature two cells; the larger cell the FA180LS and the FA100, both are modular in design, allowing for flexibility of placement on your shop floor. 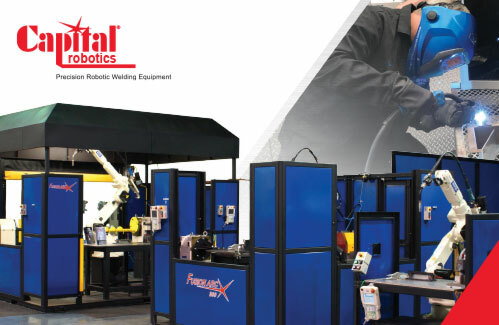 Attendees will have the opportunity to experience live demos, with both cells welding parts that have been cut by a MAZAK Laser and bent with a Safan E-Brake (which will also be in the booth). Let our staff share with you time and cost saving methodologies, such as automation, that can increase productivity and an overall higher quality product(s).